The latest model of the legendary Kalashnikov assault rifle, the AK-12, has passed the first stage of testing. 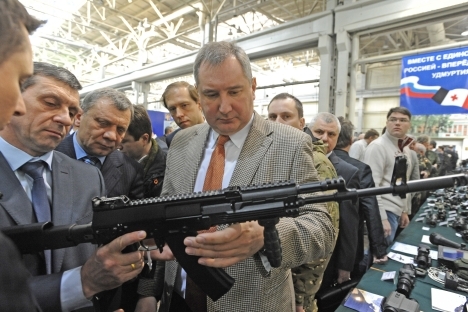 The AK-12 is moving closer to active service in Russia — only state testing planned for spring 2013 remains. Russia’s Defense Ministry has stockpiles of AK-74 ammunition and prefers not to change the caliber of the rifle. Meanwhile, arms experts predict the AK-12 will face stiff competition, at home and abroad, from earlier AK models. Designers at Russia's Izhmash plant, which developed the world's most popular automatic weapon, are hoping to be able to submit their new AK-12 model for state testing by spring 2013. State testing in Russia is the stage that precedes the official acceptance of any type of weapon into active service. The AK-12 is presently being tested at the Central Research Institute of Precision Engineering, in the suburban town of Klimovsk, near Moscow — one of the oldest centers for the development and testing of firearms in Russia. Work on the AK-12 began at Izhmash in August 2011, and the first prototype was ready by December that same year. The AK-12 can accommodate more accessories than the AK-74, which means it can be used day and night. According to Chief Design Engineer Vladimir Lepin, "various flaws have been revealed during testing, some of them critical." Still, Lepin is confident that they will be fixed in time for the next phase of testing. The AK — the first version of which appeared in the late 1940s — is obsolete, technically as well as morally. There is no question about the need for a new model of the rifle, but the Russian Ministry of Defense does not intend to change the caliber of the weapon, since Russia possesses vast reserves of 5.45 ammunition for the AK-74. Attempts to improve the pattern of shooting, reduce the weight, and allow for multiple add-ons date back to the Soviet period. The 1990s saw the appearance of the AN-94 Abakan and new models of the Kalashnikov, but they failed to meet all the requirements of the Russian military. Arms market experts see bright prospects for the new model, but warn that the AK-12 could have a hard time with competition from older Kalashnikov models already in service. According to various estimates, more than five million AK-74s have been manufactured since the 1970s. Its various modifications are used across the globe: in Latin America, the Middle East, Southeast Asia, Africa, and Eastern Europe. "There is probably no need to rely on mass orders, since the weapon is due to enter service in Russia. The new AK-12 will not be introduced in large quantities because the older models are still in good working order," says the director of the Russian Center for Analysis of World Arms Trade, Igor Korotchenko. On the export side, the new model faces strong competition from both the original AK-74 and the many illegal copies produced and sold around the world. "The weapon is good and in demand, but it's difficult to forecast how many will be purchased. Much depends on the efforts of Rosoboronexport to seek out new markets and on the position of the Ministry of Defense — whether or not it is prepared to mass procure the weapon for the military," says Korotchenko. The article is based on materials RIA Novosti and Vzglyad online newspaper.